If you aren’t using Google Now on your Android device, you should start immediately (after you finish reading this post, of course). Boasting itself as the service that offers you ‘the right information at just the right time’, Google Now is the personal assistant most of us do not have the luxury of employing. 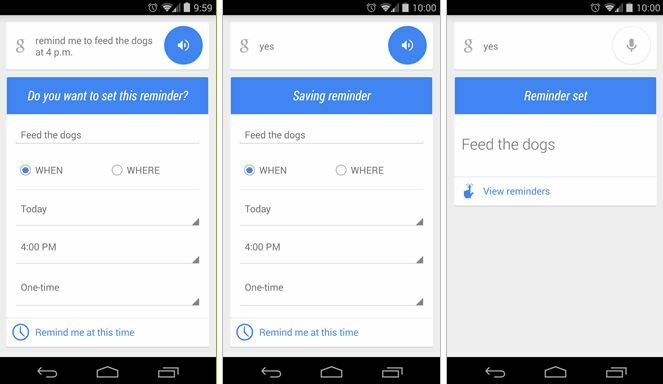 With the latest update, you can do even more with your voice, including setting reminders –as long as you are using an Android device (this functionality has not been implemented for iOS just yet). Eliminating the need to ‘click to confirm’ means your Android device just became that much more hands free –just finish by saying “yes” or “set” and you are good to go! The best part is that the change appears to be entirely on Google’s side, which means you won’t even need an update to take advantage of this new feature! This change combined with the recent feature-add allowing us to set a timer from our Android devices is proving Google Now to be an indispensable companion.